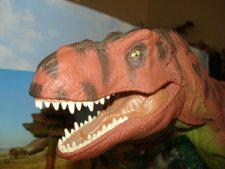 The SafariLtd Apatosaurus made 1996 a very good year. 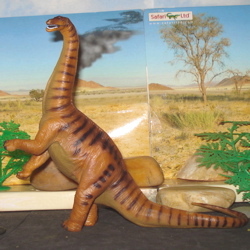 The 1996 SafariLtd Apatosaurus - Come on Down! 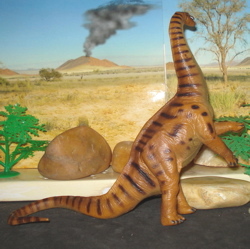 The SafariLtd Apatosaurus is standing up. The 1996 SafariLtd Apatosaurus looks as if it were excitedly jumping out of its seat to come running down the aisle on The Price is Right. Here was a radically new sculpture of what had been comparatively boring figures, plodding along on their four relatively stumpy looking legs. Safari Ltd took a risk by introducing this exciting, dynamically posed and agile figure, rearing up on its back legs and pawing the air with its front feet. 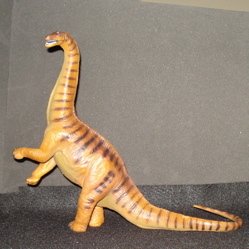 This exciting sculpt appears based upon the earlier 1994 Battat Diplodocus (left, courtesy The Dinosaur Studio, by Dan LoRusso) which is itself a major collectible. They risked accusations of "copy-cat" as well as disparagement in comparisons to the Battat figure and low sales figures for their unique presentation. Where the Battat was clearly a work of art the Safari Ltd (opens new window) version was/is significantly smaller and meant as a toy. Its success can be measured in its longevity. It was in production for fourteen years, being replaced only in 2010, by another unique Apatosaurus sculpture from Safari Ltd. In addition to the upright position we see the tail is curved in a "U" shape, another innovative detail, unseen in other companies' figures. 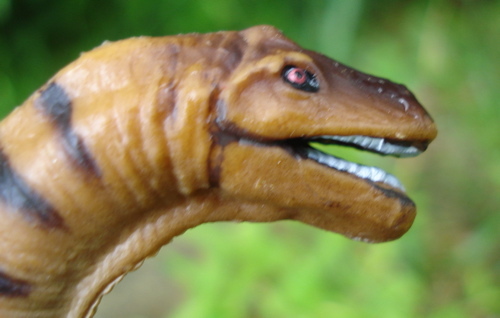 If the recent Safari Ltd Dinosaur figures have a flaw it is that their uniquely branded Dinosaur toys (they also produce the iconic Carnegie Collection (opens new window) in 1.40 scale) are in no consistent scale. The scale has to be deduced for each figure, individually. This has become of greater concern with the increased quality of their product since ~2006. 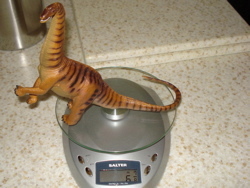 Whereas before the toy-like qualities made mismatched scales an irrelevance, with the high degree of realism in the modern figures consistent scale would be a desirable touch. Weighing In (right) at six & seven-eighth (6&7/8) ounces (195 gms) and measuring fourteen & three-quarters (14&3/4) inches (37.5 cms) from snout to tail tips this is not a small figure by any means. Handpainted in China by expertly trained artistes these are done in a variety of shades of brown, ranging from an earthy brown on the undersides to a rich mocha upper surfaces with dark chocolate stripes (hungry yet?) and claws (yes, Apatosaurs had claws), small red eyes and white teeth. 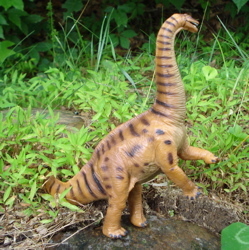 Given a length of seventy-feet for a real-life Apatosaur the SafariLtd Apatosaurus is approximately 1/57 scale. 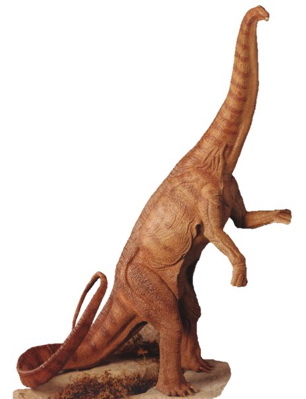 In this 'down' pose we have what appears to be a rather happy-go-lucky SafariLtd Apatosaurus kicking up his feet as he charges across the stage. 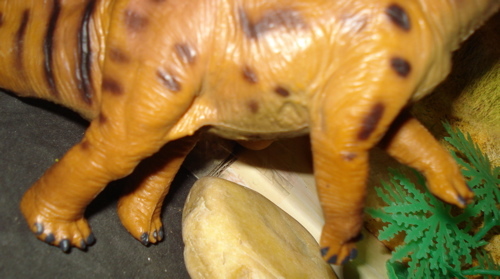 The torso, or body, of the SafariLtd Apatosaurus is surprisingly well detailed for a mid-1990s Dinosaur toys figure. The Apatosaurus' body was only about 30% of the total length and that is seen here in the approximately four inches devoted to it. Lines and ripples in the skin and bulging muscles are clearly delineated as the SafariLtd Apatosaurus stretches itself to its full height of seven & a half (7.5) inches. Even that stretchy skin linking the legs to the belly is well done. A small spinal-ridge runs down from behind the head down the back and tapers away on the tail. A smaller ridge also runs down the front of the throat and neck. The feet are very nicely done as well. All five toes are clearly done on each of the four feet with the knee (rear legs) and elbow (front) apparent in concept, if a bit blurry in execution. Rearing-up is not a regular thing for the Apatosaurus to be doing and those rear legs need to be pretty well locked-out to support the creature's great weight of approximately 30 tons. 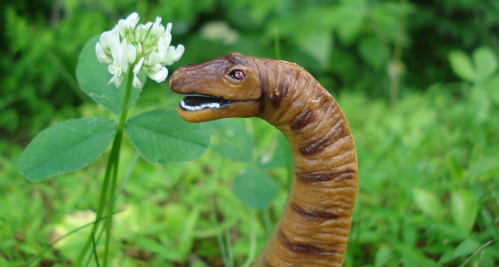 The reasons that might have led this seemingly ponderous creature to so stress itself would range from those sweet little leaf buds, high up in treetops to intimidation of other males in some elaborate courting protocol or simply to drive-off predators otherwise intent on considering the SafariLtd Apatosaurus as a meal. The front feet (left) are posed similarly to the earlier Battat Diplodocus. The right leg held lower down with the paw somewhat spread. The left is slightly crossed and held higher with a 90* bend at the 'elbow', the base of the paw concave as it is held up, showing a very natural "cupping" of its palm. All in all very well done, especially so, considering when it came out. Of minor interest here is that the 'paint job' can be seen to be somewhat asymmetrical with the darker brown markings on the ribcage and legs between the right and left sides of the figure. 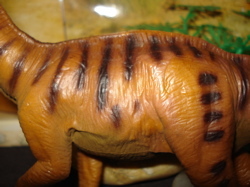 Looking down at this figure when it is on all fours provides an excellent view of its back, including the spinal ridge and the striped pattern on the body. But in both cases the dynamic look of the tail, poised to whip around at any potential danger, comes across. Taking the ant's eye view of things the SafariLtd Apatosaurus belly (below) we see the earthy-colored underside in contrast with the more vibrant (terra-cotta?) brown of the legs and upper body. If you look carefully on the left side of the photo you can see the white "ivories" of this mini-massive beastie from a plant's-eye view. The manufacturer's imprint on the belly is clear and to the point. (above) It includes the Euro-safety seal of non-toxicity, the now ubiquitous "CE." 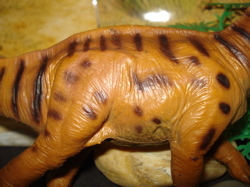 The 1996 SafariLtd Apatosaurus has been discontinued as of 2009 and it is already disappearing from retailers shelves. I have found only three sources on the internet (June 26, 2010) that still have them in stock. That surprised me. I had expected a lot more. There is a beat-up one on eBay. That's about it. The price, new, ranges from $5.49 to $8.98, plus shipping. Either these were produced in numbers that were exceedingly judicious or it really is quite the popular figure. I have no opinion on whether this will become a "collectible" or not. I do know that I like it, especially since it has that second, all-fours position option. Makes for expanded play possibilities. As for its edibility, what some consider as toxicity, it can be considered as merely indigestible, not poisonous. Unless you have a PVC allergy. Then play keep-away with all the Dinosaur toys. It was imported to the USA prior to the congressional testing requirements but it already had/has the stringent Euro-review "CE" safety seal of approval. The innovation of the curved tail, first seen in this 1996 SafariLtd Apatosaurus served as inspiration down the line for the 2006 Carnegie Amargasaurus, the 2008 Carnegie Diplodocus, the 2008 Safari Nigersaurus and ultimately (to date) the spectacularly triple-curved tail of the 2010 Safari Apatosaurus! You have been reading about the SafariLtd Apatosaurus. Click this link to return to our main Apatosaurus page for more Apatosaurus excitement!